Improve your hydraulic equipment with Parker hydraulic power units in Downey CA. While the basic principle of using pressurized fluid to generate power isn’t too complicated, when it comes to setting up a hydraulic system things can get very crowded and complicated indeed. But with Parker hydraulic power units in Downey CA, a lot of the hard work is already done for you. The power unit includes a motor, pump, reservoir, and filter that are all designed to work together perfectly with fewer opportunities for leaks. 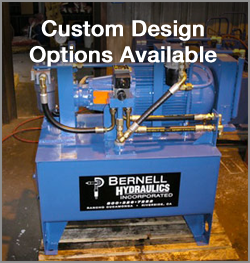 At Bernell Hydraulics, we have the quality power units you need. Several different lines of Parker hydraulic power units in Downey CA are available, with different pump types and capacities. To learn more, please contact Bernell Hydraulics. The Parker brand name carries a lot of weight, but obviously you need to get authentic Parker parts to enjoy the superior performance the name promises. As an authorized ParkerStore, you can rely on Bernell Hydraulics to always provide certified Parker hydraulic power units in Downey CA. We have the factory connections required to get you the genuine parts you require fast. In addition to power units, we carry all kinds of other Parker parts and accessories, so we make the perfect one-stop shop for all your hydraulic parts needs. Need Service for Parker Hydraulic Power Units in Downey CA? Unlike other parts providers, at Bernell Hydraulics we don’t just sell you a part and then abandon you. Instead, we offer troubleshooting and repair services for all your hydraulic parts and equipment. If your current Parker hydraulic power units in Downey CA are acting up, we can come take a look. We’ll tell you honestly whether they can be repaired or need to be replaced. Our onsite repair services are available 24/7, and because we always test our work thoroughly, you know we won’t leave the scene until your equipment is working the way you need it to. It’s easy to get your Parker hydraulic power units in Downey CA from Bernell Hydraulics. Just pick them up in one of our 3 stores, have our techs deliver them, or take advantage of our worldwide shipping. Our staff is standing by at 800-326-7252 to assist you during business hours, or you can submit an online request at any time.